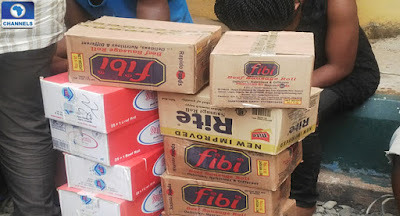 Police have arrested a suspect in Abia State allegedly involved in repackaging of expired food products. Described as a worrisome act, the police said Nnenna Sunday, 28, has perfected the act of using chemicals to erase batch production numbers and expiry dates on snacks. It is an act that endangers the lives of the buyers of the expired products, but yet reinforces the need for everyone to check well before buying any food product. After her arrest, she claimed to be innocent and obeying the orders of her boss. “I did not do anything. They have been doing it before I came. I am not the first or the second. I do not understand this type of temptation. “My hands are clean. Police saw us wiping out the expiry dates on the snacks and it is my oga (boss) that asked me to do it because that is how he has been doing it before he employed me,” the suspect said. She further claimed to have joined the company recently and do not know the boss very well, but many onlookers at the scene questioned what her conscience had told her while she engaged in the act. The arrest, according to the police was part of its determination to continue the implementation of the anti-crime strategies which are proactive in nature and geared towards ensuring a safe and secured environment for inhabitant of Abia State. The Abia State Police Command that made the arrest reiterated its readiness to sustain the fight against heinous criminal activities by improving on the existing security strategies which include visibility policing, raiding of criminal hideouts, intelligence led policing amongst many others.